Spring Is Here! Book Your Local Scarborough Vacuum Pumping Now! Trouble Shooters has offered local Scarborough vacuum pumping services out of our neighborhood office since the 90’s. We are proud to still be a family run business that supports the Scarborough community members. We offer fast, reliable plumbing services to both residential and commercial clients. Our success comes from offering a great service that we stand behind and investing in the right technology to better serve our customers. It’s finally Spring and that means Scarborough can see large amounts of rainfall in short periods of time. Our infrastructure relies upon catch basins to collect and send this water away. However, over the fall and winter, catch basins collect dirt and debris which means they could be full or even clogged! NOW is the time for property managers to be considering Scarborough vacuum pumping services. Over the years, Scarborough has been receiving heavier and heavier amounts of rainfall in shorter periods of time. This can put a significant strain on the drainage system for any property. If the catch basins haven’t been cleaned or even checked, there is a risk that they are full or clogged. This can create large spread flooding on the property should there be significant rainfall. With Scarborough vacuum pumping services, you can guarantee your property won’t experience a flood because of a full or clogged catch basin. It also provides an opportunity to look for weaknesses in the basin that could cause future issues. At Trouble Shooters, we stand behind our services with great technology. 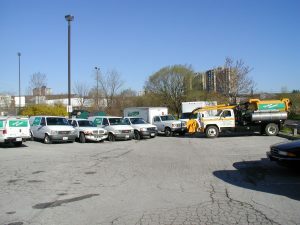 We own and operate two Scarborough vacuum pumping trucks. This means the service is performed by our team, not a third party. Giving us better quality control on our service and improved access to in-depth information. Our larger Scarborough vacuum pumping truck can service 20+ catch basins a day and take on a significant amount of debris. Our reduced truck is suited for underground garages/parking areas. At Trouble Shooters, we can service all your Scarborough vacuum pumping needs! For convenience, we offer scheduled preventative maintenance plans that takes the hassle off your shoulders to remember the service every year. For more information on our Scarborough vacuum pumping service or to get our trucks working for you, call us today! 416-291-9444.